Fiction – paperback; Tinder Press; 224 pages; 2018. 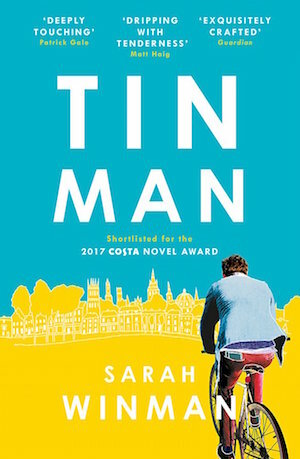 Sarah Winman’s third novel, Tin Man, is a perfectly paced story about friendship, longing and unrequited love set in Oxford and rural France spanning the late 1960s to the late 1990s. Shortlisted for the 2017 Costa Novel Award and the subject of much “book buzz” on social media last year, I wasn’t sure if this book would live up to the hype. But after hearing the author speak at the Chiswick Book Festival in September I decided I would read it as soon as the paperback edition was published. My pre-order arrived in the post this week, so I sat down on Saturday afternoon and began to read. Before I knew it I was half-way through, confirming what most of the critics have said: the story is an absorbing one. But I’m not entirely sure I loved it as much as everyone else. The story is framed around the friendship between two boys, Ellis and Michael, who meet in Oxford when they are 12 years old. This morphs into something more romantic when they are adolescents on holiday in France, but is called off when they return to the UK. Later, Ellis marries a woman, Annie, and the trio become firm friends, but when Michael moves away to London they lose contact. In the ensuing years Michael’s lover falls prey to AIDS and it’s only when bereaved that he realises he is grieving for something else: the unrequited love of his first love, Ellis. I rest till I’m calm and my breathing has settled. I lift myself out and sit by the edge of the pool with a towel around my shoulders. And I wonder what the sound a heart breaking might be. And I think it might be quiet, unperceptively so, and not dramatic at all. Like the sound of an exhausted swallow falling gently to earth. Tin Man is a well crafted story, one that is heart-rending without being sentimental, and gorgeously written without being showy. Its observations about friendship, love, loss and sexuality are astute. It is also perceptive about the destructive power of father-son relationships and shows how we should give boys the freedom to connect with their emotions and their creativity, to let them know that they “are capable of beautiful things” as Ellis’s mother Dora so beautifully puts it. But I often struggled to understand Ellis’s motivations and didn’t really warm to him. I suspect that’s deliberate given that he’s (presumably) the “tin man” of the title, the character from The Wizard of Oz who did not have a heart. Similarly, I struggled to believe that Annie would forge such a strong friendship with Michael, unless, of course, she hadn’t fully grasped he was essentially her rival. Sadly, we never get to hear her side of the story at all and the reader only ever sees her through the male character’s eyes. But I’m nit-picking. The book has been lauded far and wide. I just think I’ve read better, more emotionally devastating, books about unrequited love than this one (see below). The Last Fine Summer by John MacKenna: a heart-rending novel about forbidden love in rural Ireland in the mid-1990s. This has been on and off my list several times thanks to the endless Twitter hype, and now it’s hovering there again. LOL. It was a good read, but nothing earth shattering. I think I’ll give it a miss then. Thanks for reading it for me! Excellent! Thank you. On the list it goes. Ahhhh – I was hesitant because of the hype and I had read When God was a Rabbit and thought it was “ok” – but this one. No ifs or buts – I just loved, loved, loved it. Beautiful book. Well, you’re in good company: the paperback edition has about 6 pages of quotes from critics (mainstream press) declaring their love for it and there are more than 100 five-star reviews on Amazon.co.uk. Sometimes I think that one of the challenges of reading a lot of books is that we get nit-picky because we can think of other similar books that were better. It makes it hard to know how to review them. I think I’ll look up the MacKenna book! I know… after 30+ years of reading a steady diet of novels it sometimes feels like I’ve read it all before… I’m always looking for that elusive ORIGINAL book that feels new and different. And yes, do hunt out the MacKenna if you can… it’s a superb novel. That’s one of the reasons I like obscure and quirky books – I never know what’s going to happen! But they’re not always easy to find.